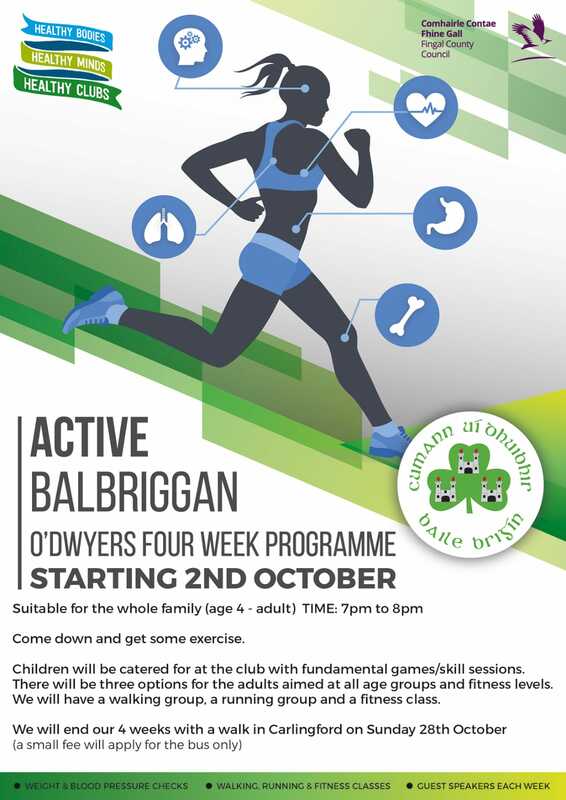 Starting 2nd October, O’Dwyers GAA will be offering something very special to the community of Balbriggan as part of the Healthy Club Project. Between 7 and 8pm for four weeks, the whole family (age 4 – adult) can come down and get some exercise. The children will be catered for at the club will fundamental games/skill sessions. There will be three options for the adults aimed at all age groups and fitness levels. We will have a walking group, a running group and a fitness class to choose from. The running and walking groups will leave the premises and the fitness class will take place at the club. Weight/blood pressure and measurements will be offered as an option. We will end our 4 weeks with a walk in Carlingford on Sunday 28th October . The only cost for this initiative will be the bus to Carlingford so what are you waiting for!! !